A Linux Ext file system (Ext2/Ext3/Ext4) volume has a global descriptors table. Descriptors table records are called group descriptors and describe each blocks group. Each blocks group has an equal number of data blocks. A data block is the smallest allocation unit: size vary from 1024 bytes to 4096 bytes. 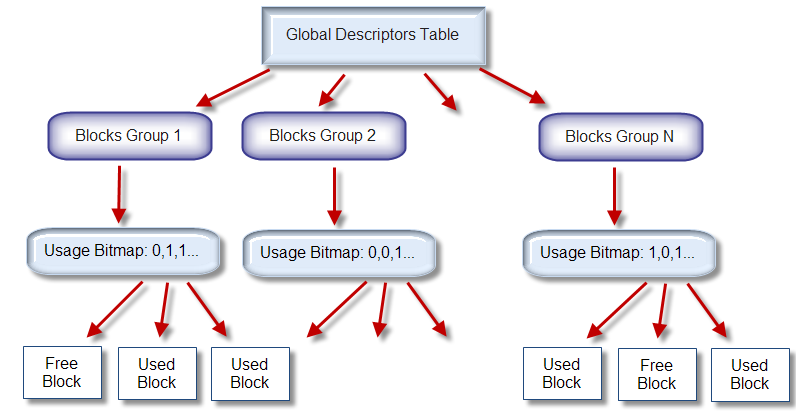 Each group descriptor has a blocks allocation bitmap. Each bit of the bitmap shows whether the block is allocated (1) or available (0). KillDisk software enumerates all groups, and for each and every block within the group on the volume checks the related bitmap to define its availability. If the Block is available, KillDisk wipes it using the method supplied by the user.